London-based provider Databarracks has been recognised in Gartner’s Magic Quadrant for Disaster Recovery as a Service 2017. Peter Groucutt, managing director at Databarracks, commented on the announcement: “We are very proud to be included in the Magic Quadrant for DRaaS for a third consecutive year. We feel it is an incredible achievement for us as a specialist provider of disaster recovery and business continuity services and is a testament to the hard work and commitment of our team. “There has been a great deal of change in the last year. We have seen some commoditisation in the market and this year’s MQ reflects that with many more service providers evaluated. I completely agree that DRaaS has now become a ‘mainstream offering’. Organisations now recognise that DRaaS is a mature service and the benefits extend beyond pure cost savings. The organisations we speak to appreciate the value a specialist DRaaS provider brings. Customers of DRaaS know that in the event of a disaster, they not only have the technology to allow for rapid recovery but the skills of recovery specialists to bring their IT back online, minimising data loss and downtime. “In the last 12 months we have also seen further change in both the risk landscape and the attitude towards IT downtime. The recent WannaCry attack raised the level of awareness of ransomware beyond the IT team and into the wider business-consciousness both here in the UK and around the world. Major IT outages have also highlighted just how reliant organisations are on technology to deliver their services – whether that is an airline, a bank or a university. 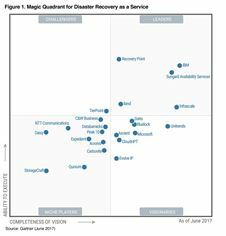 To get a copy of Gartner’s Magic Quadrant for Disaster Recovery, go to Magic Quadrant for Disaster Recovery as a Service.